Let's say I tell you that I'm converting my home to all energy efficient LED lighting so I can save energy and money and reduce my carbon footprint. You come to visit one evening and you're surprised to find my home blazing with light--every lamp and fixture in every room on though unoccupied, porch and garage lights left on all night long. Many of the lights are much brighter than they need to be for their purpose--reading or dining or seeing your way up the stairs. Worse yet, some are so intensely blue-white they hurt your eyes, especially the outdoor fixtures with exposed diode arrays. And since LEDs are so 'efficient', I've added more fixtures. Would you applaud my energy efficiency? This is exactly what has been happening with many LED installations , including streetlight conversions. LED's efficiency too often becomes an excuse to use even more of it, lighting what doesn't need to be lit more of the time at higher levels. LED's greater perceived brightness and improved visibility means we can and should use lower illumination levels, but decision makers (DOTs particularly) keep applying the same on-the-ground target illumination standard rather than shifting downward within the recommended range. 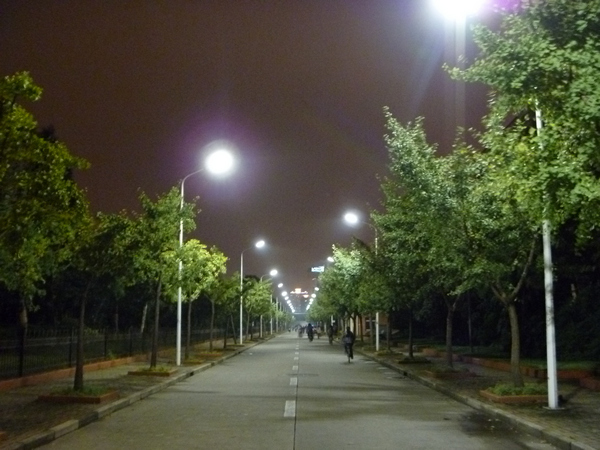 And LED installations too rarely have included the technology's greatest advance and advantage: adaptive control, the sophisticated means to tailor lighting to locations, times, and conditions with dimming and brightening, part-night lighting, and maintenance monitoring with the capacity to dramatically cut consumption, costs, and light pollution. HB 1988 did not include any language addressing adjustment in illumination levels or provision of adaptive control capacity. The most familiar pitfall of LED lighting is blue-rich light: higher Color Correlated Temperature--measured in Kelvin--intensifies glare (harming vision and reducing visibility), exacerbates melatonin suppression, amplifies sky glow, and disrupts ecosystems with increased impacts to wildlife. IDA has been warning about blue-rich light since 2010 and over three years ago revised its Fixture Seal of Approval program to include a 3,000K or below limit. Last year the American Medical Association affirmed a 3,000K limit for human health and safety. IDA members and other advocates are working in their communities to establish a 3,000K standard and are specifically collaborating with electric coops to eliminate the use of 4,000K and 5,000K fixtures. In addition to DSP-certified Staunton River State Park, we have efforts underway at about six locations, including two to three state parks, to pursue Dark Sky Place designations. High CCT lighting would be at odds with those efforts. HB 1988 did not include a Color Correlated Temperature limit or consideration of dark sky conservation efforts. So that's why Virginia IDA opposed passage of HB 1988 LED Outdoor Lighting. We are not opposed to LED lighting and certainly support energy efficiency--real energy efficiency does not risk our night skies or the aesthetics of our communities and is consistent with quality outdoor lighting. For more information on wise and responsible approaches to LED lighting, go to IDA's blog posts and Virginia's own Smart Outdoor Lighting Alliance. For an example of adaptive control and warm CCT in action, check out this Thames-side park that serves the public while protecting a crucial wildlife habitat corridor.